It was 9pm on a Wednesday evening when I finally arrived in Madrid. Superficially most cosmopolitan cities in developed nations look similar: a main thoroughfare leading into and out of the city, some tall building, billboards, neon signs on top of buildings and the like. What struck me about Madrid's skyline were two things. First there were actually skyscrapers. Having lived in Rome I learned that sometimes in old Europe a 10 story building could be considered a skyscraper. Madrid, I could safely say, was home to at least two skyscrapers visible in the night. Second, aside from the neon signs advertising cell phone manufacturers and insurance providers, the most noticeable thing in the skyline was a a flashing green light coming from one of those skyscrapers. In my hazy, sleep deprived, state I managed to find my voice and put together a basic Spanish phrase: “Que es eso?” or “What's that?” while pointing to the flashing light. “Ah, that is a very special thing,” said the World Youth Day colleague who had been assigned to pick me up at the airport, “That light announces the presence of the Blessed Sacrament.” I nodded and looked up. As we passed the light I put two and two together and piped up again saying, “But that's an office building!” My WYD friend smiled and launched into the story of “The Jesus Light,” as he called it. The tower with the flashing green light is indeed an office building, one of four in a newly constructed business complex in a rapidly developing financial district. Employees of one of the businesses with space in that tower were in a meeting one day when one of the managers mentioned he had to leave at a certain time because he had to get to Mass. Another executive made a comment about how the complex had all kinds of other amenities but no church or chapel to speak of and pointed out that if the complex had a chapel employees wouldn't waste time trying to get out into the city to make it to Mass. The employees all agreed and decided to present the idea to the development company that owned the towers. The building owner and manager agreed with the idea. The tenants of the building decided the chapel should go on the 33rd floor of the tower known as Torre Espacio. A simple but functional chapel was made out of a room 120 sq meters with floor to ceiling windows looking out over the city. The chapel was recognized by the Archdiocese of Madrid as an official chapel/oratory under the jurisdiction of the archdiocese and a chaplain was appointed. Fr. Manuel Sanchez was appointed to serve this little chapel in the sky in addition to his duties as pastor of the nearby parish Santa Maria del Val. At first Mass was offered twice a week at Torre Espacio. The demand was so great that Masses were added every day of the week, and a rosary group began to meet in the chapel before Masses. The chapel can accommodate 30 people seated, with room for another 30 standing. The crucifix is a stunning full size piece hanging against the floor to ceiling windows over the skyline of Madrid. And the green light? I was told the chapel was outfitted with a panel of flashing green LED lights specifically to announce silently, but unmistakably, the presence of Christ in that little chapel high above the city. The light can be seen from the various neigbourhoods to the north of the Torre Espacio tower. At first some residents complained, demanding to know why that green light kept flashing all night long. According to one report, one of the disturbed Madrilenos upon being told what the light was for, declared, “That gives me peace.” Patients in a nearby hospital who could see the light from their windows also made it known that the light was comforting as it reminded them that Christ was with them in their trials. 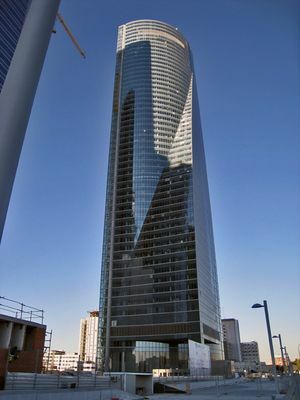 Torre Espacio is located in the Cuatro Torres complex in the Chamartin neighbourhood of Madrid. Other tenants of the complex include the Canadian, Australian, British and Dutch embassies. For a virtual tour of the chapel click here, or watch this YouTube clip of the exterior and interior of the chapel.